A pendulum is one of the simplest and easiest forms of divination. It's a simple matter of Yes/No questions being asked and answered. Although you can purchase pendulums commercially, ranging from about $15 - $60, it's not hard to make one of your own. Typically, most people use a crystal or stone, but you can use any object that's got a bit of weight to it. Take the crystal and wrap it in a length of jeweler's wire. When you're done wrapping it, leave a loop at the top. Attach one end of the chain to the loop. You'll want to make sure the chain isn't too long, because you'll probably be using it over a table or other surface. Generally, a chain between 10 - 14" is perfect. Also, be sure you tuck in any poky pieces of wire so you don't jab yourself later. It's a good idea to charge your pendulum, by placing it overnight in water or salt. Remember that some crystals will degrade in salt, so be sure to check before you do this. Another option is to leave the pendulum outside overnight in the moonlight. To calibrate your pendulum simply means you're checking it to see how it's working. To do this, hold it by the free end of the chain so that the weighted end is loose. Make sure you keep it perfectly still. Ask a simple Yes/No question to which you already know the answer is Yes, such as "Am I female?" or "Do I live in California?" Keep your eye on the pendulum, and when it starts moving, note whether it goes side to side, forwards to backward, or some other direction. This indicates your "Yes" direction. Now, repeat the process, asking a question to which you know the answer is No. This will give you your "No" direction. It's a good idea to do this a few times with different questions, so you can get a feel for how your pendulum responds to you. Some will swing horizontally or vertically, others swing in small or large circles, others don't do a whole lot unless the answer is really important. Once you've calibrated your pendulum and gotten to know it a bit, you can use it for some basic divination. However, it can take a little bit of practice to get comfortable. Desmond Stern over at Little Red Tarot says, "For the longest time, I’d sit there with my weighted string, dangling it and wondering, “Am I unconsciously moving it? What am I doing here?” It felt weird. I was used to cards and scrying and for some reason, as appealing as pendulums were to me in theory, it took me a long time to come to trust them. Now when I use one, it’s like an extension of my arm. It no longer worries me that I might be unconsciously moving it to suit my desires because I’ve come to realize that even if that is the case (and I’m not sure it is) my unconscious movements often reflect inner connection. It ultimately doesn’t matter. This bit of string and beads and my grandmother’s ring that I’m holding, such a simple tool, is a sacred object. And it’s good to listen to what it has to say." There are several different ways you can use a pendulum for divination - you'd be surprised what you can learn with "yes" and "no" answers. The trick is to learn to ask the right questions. Here are some ways you can take advantage of your pendulum to find out what you'd like to learn. Use with a divination board: some people like to use their pendulum in tandem with a board - the pendulum guides them to the letters on the board that spell out a message. Much like an Ouija board, a pendulum board or chart includes the letters of the alphabet, numbers, and the words Yes, No, and Maybe. Find lost items: much like a dowsing rod, a pendulum can be used to point in the direction of missing things. Author Cassandra Eason recommends "remote dowsing [in which] you can also scribble a diagram of an area or use a map and hold the pendulum over the map to find where it vibrates to locate water, pipes or even a lost cat that may be hiding in the place identified on the map. Finding the target in actuality is then relatively easy, using your dowsing rods as you walk around the identified area." If you have a specific but complex question, try laying out a group of Tarot cards with the possible answer. Use the pendulum to lead you to the card that has the right answer. 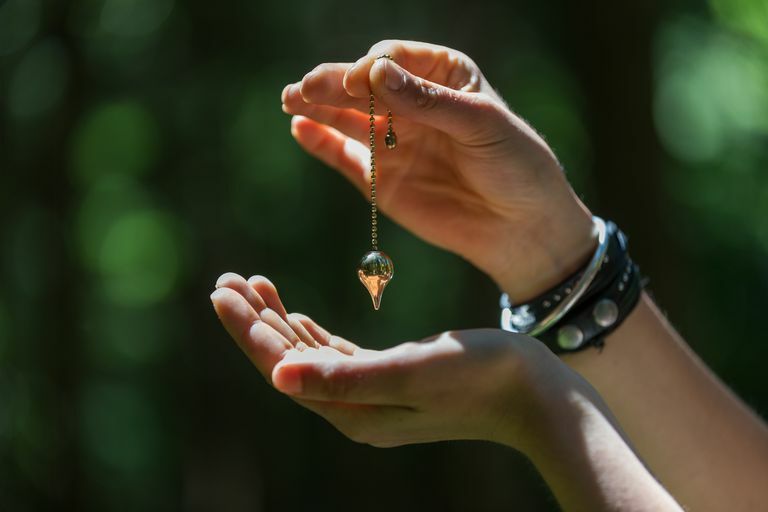 Locating magical sites: if you're outdoors, carry your pendulum with you. Some people believe that ley lines can be located via pendulum use - if you happen to stumble across a location that makes your pendulum go crazy, consider holding ritual there.